Astronomers have gained an important clue about a ubiquitous cosmic process by pinpointing the exact moment when gigantic "bullets" of fast-moving material were launched from the region surrounding a black hole. They made this breakthrough by using the ultra-sharp radio "vision" of the National Science Foundation's Very Long Baseline Array (VLBA), along with NASA's Rossi X-ray Timing Explorer (RXTE) satellite, to study an outburst from a system including a black hole and its companion star in 2009. VLBA images show fast-moving jet "bullets." Black holes in such binary-star systems can pull material from their companions. That material forms a rapidly-rotating disk of material around the black hole, and "jets" of material are thrown outward perpendicular to the disk. Most of the time, the jets show a steady flow of material, but occasionally the steady jets disappear and superfast "bullets" of material are ejected at speeds approaching that of light. Such an outburst can produce as much energy in an hour as the Sun emits in five years. "Until now, we've never been able to determine the exact time when the superfast ejection occurred. With this new result, we can clearly see how the change in jet behavior is accompanied by dramatic changes in the X-ray emission coming from around the black hole," said Gregory Sivakoff, of the University of Alberta. Sivakoff presented the findings of a research team to the American Astronomical Society's meeting in Austin, Texas. The new clue will help scientists understand the physics of such exotic and complicated objects. Similar disk-jet "engines" are seen in a variety of objects throughout the Universe, from young stars to the supermassive black holes at the centers of galaxies, and the energy pumped out by the jets can have a significant impact on their surrounding cosmic environments. However, the exact mechanisms behind these "engines" remain enigmatic. The astronomers studied a black hole system called H1743-322, about 28,000 light-years from Earth. This system has had several outbursts since its discovery in 1977. They observed an outburst from May to August, 2009, gathering data with the VLBA, the Very Large Array, the Australia Telescope Compact Array, and RXTE. This collection of telescopes revealed changes in the system's X-ray and radio emission as the outburst progressed. The extremely-detailed images with the VLBA showed a pair of the "bullets" separating from the object's core and moving outward along the jet path. "By measuring the motion of this ejected material, we were able to work backwards and calculate the exact time of its ejection. Our result has changed some previous assumptions about where in the sequence of such events the ejection occurs," said James Miller-Jones, of ICRAR -Curtin University in Australia. "Pinpointing the ejection time was only possible by simultaneously using RXTE and the VLBA," added Miller-Jones, who was leader of the research team on H1743-322. 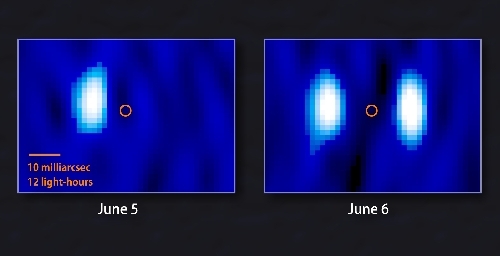 In addition to identifying the ejection time, the observation campaign was able to trace the entire cycle of changes in the system's X-ray emission and correlate them to changes in its radio emission. While this clue is important, the astronomers caution that outbursts from similar systems may vary significantly in their characteristics. "To really understand how these things work, we need to perform the same type of simultaneous radio and X-ray observations on many more stellar-mass black holes with transient jets," said Diego Altamirano of the University of Amsterdam. The VLBA, dedicated in 1993, uses ten, 25-meter-diameter dish antennas distributed from Hawaii to St. Croix in the Caribbean. It is operated from the NRAO's Domenici Science Operations Center in Socorro, NM. All ten antennas work together as a single telescope with the greatest resolving power available to astronomy. This unique capability has produced landmark contributions to numerous scientific fields, ranging from Earth tectonics, climate research, and spacecraft navigation to cosmology. Ongoing upgrades in electronics and computing have enhanced the VLBA's capabilities. With improvements now nearing completion, the VLBA will be as much as 5,000 times more powerful as a scientific tool than the original VLBA of 1993.